4 Bedroom Detached House For Sale in Prestbury for Guide Price £1,595,000. 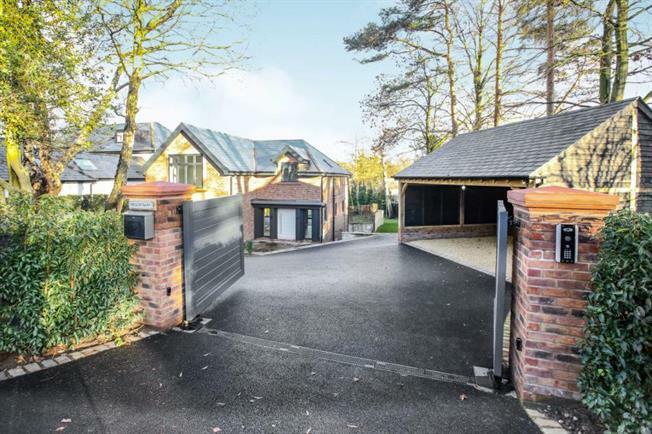 An exquisite, intelligently planned home that offers tailored finishes, contemporary fittings and bespoke accents throughout tucked away behind a secure gated entrance and set within pavement walking distance of Prestbury village centre. Having been newly constructed in 2018 Willowbank has been designed to cater for modern family living with its flexible living accommodation and grand room proportions. The accommodation briefly comprises; welcoming reception hall, cloakroom / wc, living room, media room and guest bedroom suite with luxuriously appointed ensuite bathroom to the ground floor. The striking central staircase leads to the lower level accommodation. The highlight of this floor being the beautifully appointed living kitchen that extends to almost 40'. The living and dining areas offer direct access via bi-folding doors onto the rear gardens making an ideal entertaining area. The first floor hosts the master bedroom suite with fitted dressing area and luxury ensuite. There are also two further double bedrooms to this floor served by the sumptuous family bathroom. driveway leads to the double car port. The front and rear gardens offer an excellent level of privacy and have been thoughtfully landscaped working with the natural contour of the plot. The gardens wrap around the property following a gentle slope and creating a real sense of grand proportion. The majority of the gardens are laid to lawn with entertaining terraces, a walled garden area and sculpted borders.